Legendary automotive designer Ray Dietrich designed the original Thunderbird Bass in the early 60s. The new Epiphone Thunderbird Vintage PRO uses the same profile of the original factory models with a 7-ply Mahogany and Walnut neck attached to Mahogany body wings with a through-neck joint. 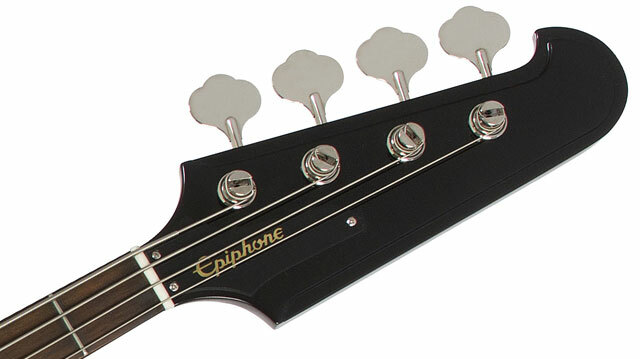 The neck has a 1960s style rounded profile and has a 34” scale, a 12” radius, and 20 medium jumbo frets. The fingerboard has pearloid dot inlays just like the original, and the familiar Thunderbird headstock has a black truss rod cover with the 60s era Epiphone logo silkscreened in gold. The 3-Layer white and black pickguard has the original "Thunderbird" logo in black. The Thunderbird Vintage PRO is available in Alpine White, Ebony, and Tobacco Sunburst. The Thunderbird Vintage PRO Bass is powered by Epiphone’s critically acclaimed new ProBucker #760 Bass Pickups which are made with the same attention to detail as the ProBucker™ and P-90 PRO™ guitar pickups. ProBucker pickups are made with sand cast Alnico II magnets, high quality 4 conductor lead wire, and are vacuum wax potted to eliminate microphonics. Gold “Top Hat” control knobs with chrome metal inserts allow for individual Neck and Bridge volume settings along with a Master Tone control. 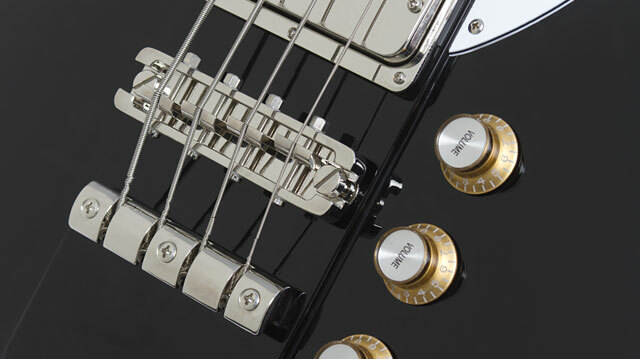 The Thunderbird Vintage PRO Bass comes with a nickel-plated 1960s styled Tune-o-matic bridge and Claw tailpiece inspired by the original Thunderbird bridge along with open-gear bass tuners with historic "Clover" buttons and a pro 17:1 tuning ratio. A hard case is also available. Each Thunderbird Vintage PRO Bass includes Epiphone’s Limited Lifetime Guarantee and world famous Gibson 365/24/7 worldwide customer service. Visit your Authorized Epiphone Dealer or visit Epiphone.com today to find one near you and discover the legendary hit-making Thunderbird Vintage PRO Bass!